A family day out is real rarity in our household. We are currently all living on the same continent, which is a bonus, but that hasn’t always been the case. They always say you should feel proud as a parent that you’ve given your fledglings the confidence to flap their wings and fly away – but I do sometimes wish they hadn’t flown quite so far (although to be fair to our children we have done our own fair share of flying in the past). 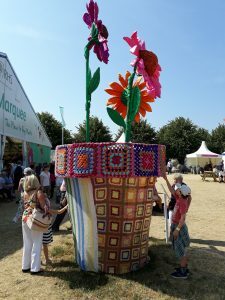 With our elder daughter on sabbatical from her job in Budapest and working in London for three weeks, we took the opportunity to meet up for some quality time together, plans which included a visit Hampton Court Flower Show on one of the hottest days of the year. My house in the UK has a fairly compact garden, but after spending a large part of the last nine years or so living in rented apartments overseas, I value my own personal outdoor space. I’d like more, but that’s because I look back through my rose tinted spectacles to the days when we had a third of an acre plot, complete with our own bluebell wood and children who needed trampolines, pop-up pools and wendy houses. Those days are gone – and so has the industrial-sized lawnmower. It’s not a question of quantity, but quality. I still watch Gardeners World, I grow my own herbs and salad veg, albeit in high-rise containers to defy the slugs. 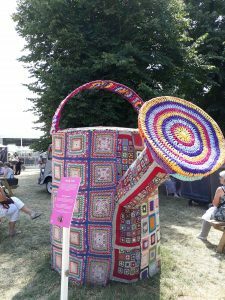 I have a choice of seating areas, where I can chill out with a book in dappled shade or full-sun; we even have a pint-sized pond. I’ve crammed my borders full of plants to attract butterflies and ungrateful bees (I was recently stung), and we have visiting hedgehogs. It’s a little oasis. 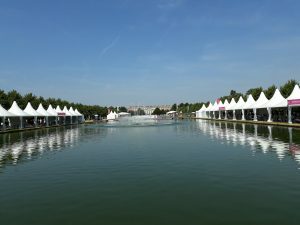 While our young ladies revived themselves with Pimms, Mr T and I wandered around looking for further inspiration. I’ve now found the perfect solution to keeping occupied during long winter evenings when the great outdoors is out of bounds. 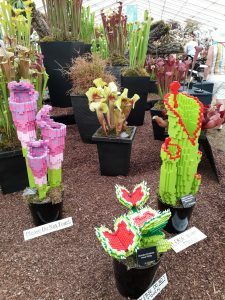 We don’t need a bigger garden – we can create horticultural masterpieces from the comfort of our own settee. A knitting project for me, and a lego one for him. But of course the best part of the day was being together – so that the kids could squabble just like they did when we all lived under one roof. To be fair my girls get on a lot better when they live apart, there is some truth in that old adage that absence makes the heart grow fonder. A day out anywhere provides inspiration for a writer, characters, settings, planting schemes, I soaked it all up. 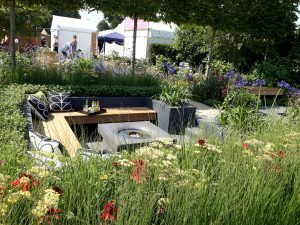 Even if I can’t recreate those show gardens in my own backyard, I can certainly transplant the ideas into my next book – The Garden of (My) Dreams….watch this space! 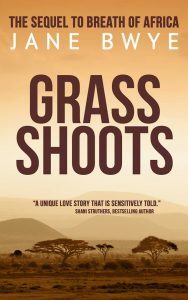 This week fellow author Jane Bwye joins me to discuss her favourite ‘comfort reads’. Thank you for having me, Rosie. I don’t know if I’d call them “comfort reads”, and I’ve had to think a bit before making my final choices, based roughly on the number of times I can sort-of remember reading them. The truth is, it’s several years since I’ve opened the pages of any of them. But your invitation has reminded me. I am an utter romantic at heart, and although I’ve never been to Russia, Boris Pasternak’s Doctor Zhivago has been my favourite read for as long as I can remember. As a sixteen-year-old, I read it a few times, then in 1965 I saw the film, and because in this rare case the film is every bit as good as the book, I now think of both, when re-visiting either. And that haunting music never fails to stir my soul. 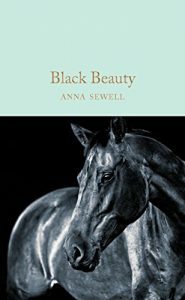 You definitely cannot class Anna Sewell’s Black Beauty as a comfort read. I first read it way back before my teens and could never resist the temptation to repeat the exquisite torture again and again, barely able to see the words on the page through my tears. I have always been crazy about horses, which doesn’t help. I picked it up again about six years ago, as I’d come to live in Sussex where the book is set. To my shame, even in later life, the tears spoiled the pages and I was devastated that it could still affect me so much. My mother introduced me to Nevil Shute at an early age, and Australia has been part of my dreams ever since. 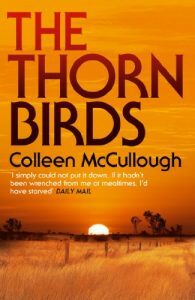 When I came across The Thorn Birds by Colleen McCulloch, I was in seventh heaven. I remember first reading it from cover to cover twice through without a pause, and a copy still graces my book shelves, ready for whenever I feel like a bit of self-indulgence. There’s one more book, which I just cannot leave out. 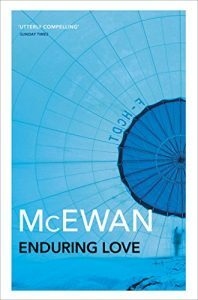 Enduring Love by Ian McEwan. I am not blessed with a good memory for stories, and whenever I pick it out, remembering the totally satisfying and tingly feelings it gives me, it is as if I’m reading it again for the very first time. …And on 15th August 2018 I’ll be launching something entirely different. 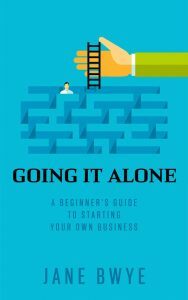 A Guide to starting your own business. Even authors need to show some business acumen these days. 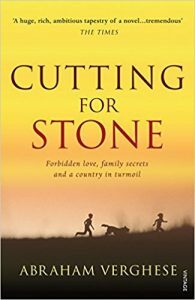 If you pre-order from Amazon now, you’ll get the special price of £/$.99! Jane Bwye lived for 55 years in Kenya. 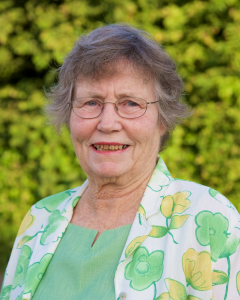 She has been an intermittent free-lance journalist most of her life and has written several books. Her large family, scattered over three continents, are a good excuse for her to indulge in travelling. A former teacher, and owner of several small businesses, she works as a business mentor for small business start-ups. What a difference a year makes. 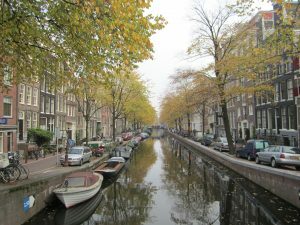 It’s just over twelve months since I moved back to the UK from the Netherlands. I’ve had to adjust, to get used to living in the tranquillity of countryside after three years in of living in busy towns with everything on my doorstep. I’ve had to rely on a car again. No point having a bicycle in my home village – there’s only one way out of it – uphill. I’ve had to re-establish friendships – oh you’re back again are you? (It wasn’t the first time we’d moved away). This time last year I was in a huge dilemma about my writing. 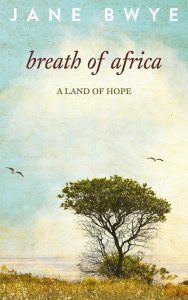 Whilst still in Holland I had received a positive response from one of the many publishers I’d sent my first novel to. On my return to the UK we met and they offered me a contract. 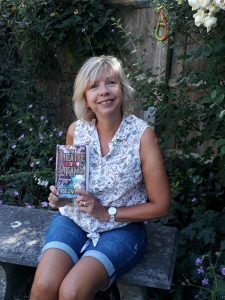 I should have been over the moon, but I wasn’t…because by this time I’d finished writing The Theatre of Dreams and I liked it an awful lot better than Book 1. The contract I was offered gave the publisher first option on my second book. They already wanted changes to Book 1 to suit their style, and any subsequent books would have to follow a pattern. The Theatre of Dreams would take a fair bit of re-writing to fit the mould. So, what did I do? I reminded myself how long I’d waited to find a publisher. I wanted to be a published author. Surely I could make the changes, a published e-book (there was no promise of a paperback) was better than no book at all. I could compromise…couldn’t I? Fate works in mysterious ways. I then saw a Twitter post from one of the big publishing houses requesting one line pitches, and I thought, why not? I was still dithering about the contract, so I submitted a pitch for The Theatre of Dreams – straight away I was asked for the first three chapters and a synopsis. Although they quickly replied it wasn’t totally what they were looking for, a standard rejection response, they did say they liked my style. It was the kick I was waiting for. I took a leap of faith. I wrote to the first publisher and told them I’d changed my mind and I didn’t want to go ahead with the contract. Of course, I still had to find a publisher for The Theatre of Dreams, and I had to face a few puzzled queries from various quarters (including my other half) of what, you’ve turned a publishing contract down? But within a few months the deed was done. I found Crooked Cat, and now, twelve months on, I don’t just have an e-book ready for publication, I have a paperback. I have a novel that I’m proud of, that was great fun to write, and hopefully great fun to read. 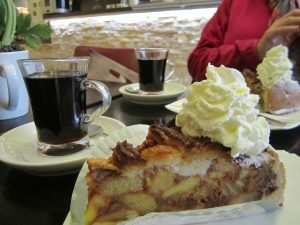 And as for adjusting to life back in the UK, yes there are still things I miss about the Netherlands, especially this – appelgebak met slagroom, but as I no longer consume vast quantities of calorie-laden Dutch delicacies, I don’t feel quite so bad about giving up the bike!